Protect content quickly and easily in multiple devices and platforms. PallyCon Multi-DRM Service can be easily integrated with various HTML5 web players via 'Encrypted Media Extensions(EME)' and 'MPEG Common Encryption(CENC)' specifications. Using HTML5 web player with PallyCon Multi-DRM, you can stream DRM-protected audio/video contents without plugin on EME-supported web browsers such as IE11, Edge, Chrome, Firefox, and Safari. Please refer to the below links for the EME HTML5 standards and the use cases of protecting audio contents using multi-DRM. This tutorial is a step-by-step guide to integrate with Bitmovin Video Player among various HTML5 player solutions. Bitmovin Player supports PC/Mobile web browsers as well as iOS and Android native applications using native player SDKs. So you can integrate PallyCon multi-DRM with Bitmovin Player for web browsers, mobile apps, and OTT platforms such as smart TVs in the same way. PallyCon Forensic Watermarkingand Multi-DRM are cloud-based content security services which are developed and served by INKA Entworks PallyCon Multi-DRM provides license management of PlayReady, Widevine, FairPlay Streaming, and NCG DRM. It is integrated with various encoder/transcoder solutions and player solutions for easy deployment of multi-DRM to online video services. Bitmovin is a global solution provider of video related software solutions such as video encoder, player, and analytics. 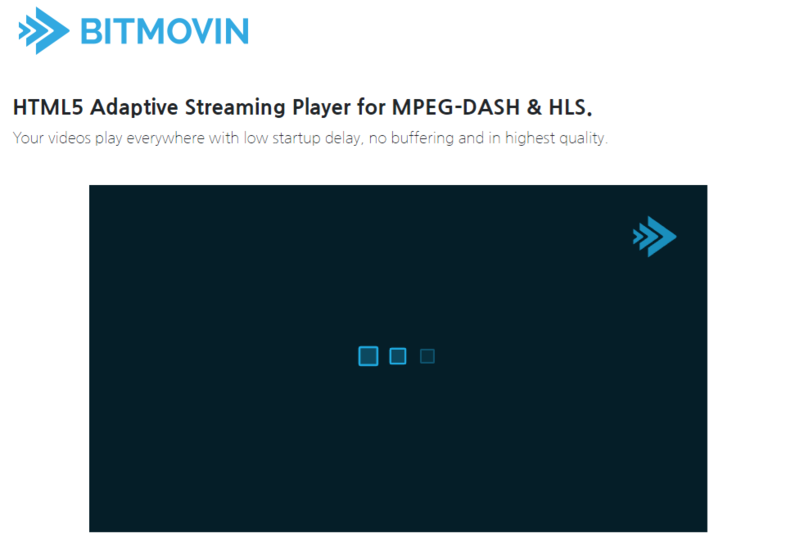 Bitmovin Player supports HLS and MPEG-DASH streaming playback on a variety of platforms including web browsers, mobile devices and smart TVs. This tutorial has three steps as below. To make it quick and easy, the integration is based on PallyCon CLI Packager and DRM license token. Please refer to the below links for more details about PallyCon CLI Packager and the license token integration. To follow this tutorial, you need to sign up for trials accounts on PallyCon and Bitmovin web sites. Browse to PallyCon Console login page and click 'Sign up' button. Fill in the sign up form as below and click 'Sign up' button on the form. You will receive the welcome email on your email account used for the sign up. Click the 'Verify' button to verify your email. The trial site on PallyCon service will be created after the verification. Sign in to PallyCon Console site and go to 'Integration Settings' page under 'Site Settings' menu. Copy and paste the 'Site ID', 'Site Key', and 'Access Key' values on a text editor such as Notepad. These values will be used in later stages for the DRM integration. Browse to Bitmovin website and click 'Sign up' link. Create your trial account through the sign up forms as below. 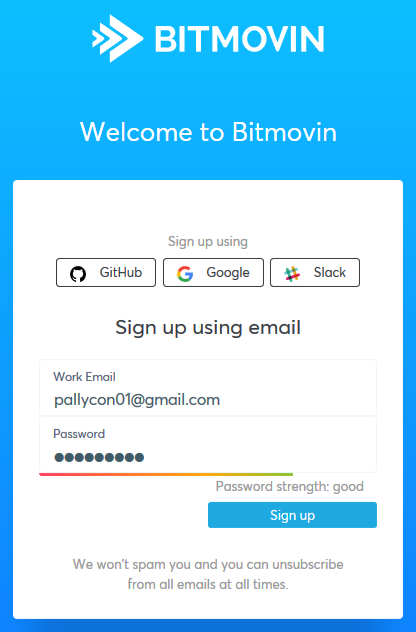 You will receive Bitmovin account activation email the same as PallyCon. Click the 'Activate your account' button to verify your email. You need to add your test server's domain on Bitmovin player's license setting by following below. Login to Bitmovin site with your trial account and go to 'Player > Licenses' screen. Click the trial license key shown on the screen. The page will be switched to the 'license details' screen. Input your test web server's domain as shown below and click 'Add' button. It may take several minutes for the domain setting to take effect. You need to package a video to test DRM content playback on the player. Follow the below guide to perform DRM content packaging. PallyCon CLI Packager supports 64bit Windows and Linux(Ubuntu, CentOS) OS. Gcc and g++ libraries (6.0 or later) are required for Linux OS. Copy an MP4(H264 AVC) video file for the test to the same folder as the PallyCon CLI Packager executable. You can use the PallyCon introduction video linked below if you want. PallyCon CLI Packager supports DASH-CENC (Widevine, PlayReady) and HLS-AES (FairPlay) packaging for multi-DRM, as well as NCG and NCG-HLS packaging functions for Netsync Content Guard (NCG) DRM. In this tutorial, we will only proceed with DASH-CENC packaging for a brief test. Run the command as below to perform a DASH content packaging. Please refer to the below table for the details about each parameters. Input value: The trial site ID which is shown on 'Integration Settings' page of PallyCon Console site. Input value: The access key string which is shown on 'Integration Settings' page of PallyCon Console site. Input value: Unique ID of content to distinguish each content when DRM packaging and licensing. 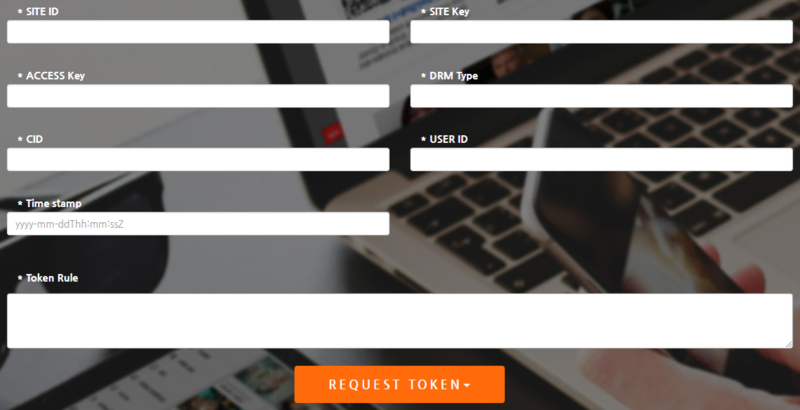 The DRM encryption key and license are managed based on the ID, and the content ID managed by the CMS (Content Management System) is generally input. Input value: The name of the original MP4 file to be packaged. If the package is in a different path from the executable file, enter the file name including the path. If the command is configured according to the input value shown above, it is as follows. The site ID and the access key, which are shown as examples, do not actually work, and you must replace them with the values that correspond to the account you joined in Step 1. After the packaging is successfully completed, the history will be displayed on the 'DRM Packaging History' page of the PallyCon console site as shown below. When packaging is complete, an MPEG-DASH content is created, consisting of an mpd manifest file and audio / video tracks in the 'dash' folder in the output folder. To test DRM content playback in Step 3, you must upload the folder to the test web server. Upload DASH content to the storage associated with the CDN or to a typical web server. Browsers such as Chrome and Firefox are forced to apply HTTPS to all URLs related to media streaming for security reasons. For the playback testing in step 3, you must apply an SSL certificate to your test web server and use an HTTPS URL. Play the DASH content that you packaged in Step 2 using the Bitmovin player. DRM license integration and content playback are performed through the following process. 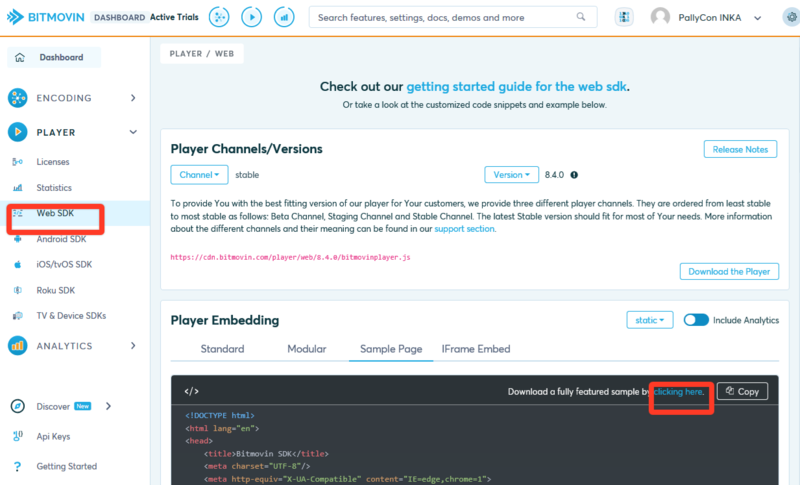 Log in to the Bitmovin site and go to the 'Player > Web SDK' screen. Click the 'Sample Page' tab in the 'Player Embedding' section and click the 'clicking here' link in the image below to download the sample html file. Edit the 'bitmovin-player-samplepage.html' file that you downloaded with a text editor. If you search the string '.mpd' with the search function first, you will go to the following part. Modify the contents of the above source to fit the test environment as shown below. The mpd file URL in the above source code should be replaced with the URL that corresponds to the DASH content uploaded to the test web server in Step 2. The value of "CUSTOM_HEADER_VALUE" should be replaced with the value of the license token generated later in the process below. In order to play the packaged content, the DRM license must be issued to the player through DRM license integration. PallyCon Multi DRM supports callback and token type licensing, and in this tutorial we will proceed with token licensing. For detailed instructions on how to issue licenses, please refer to the online guide linked below. The token used in the license request must be generated in accordance with the specifications in the server side (backend) of the video service to which PallyCon Multi-DRM will be applied. In this tutorial, you will use the 'Create token' function provided on the 'Developer Console' page of the PallyCon site for quick testing. Go to the Developer Console page at the link below and enter the below items on the form. USER ID A unique user ID used to verify the rights of the content service user. Input value: A unique user ID used to verify the rights of the content service user. In the token-based license integration, a token must be generated after the authorization check is completed between the content service backend and the client. Input value: The validity time of the token. Generally, it is set as token generation time, and the token is valid for 600 seconds after that point by default. The length of validity can be configured on PallyCon Console site. Input value: The site key string which is shown on 'Integration Settings' page of PallyCon Console site. Input value: The content ID which was input to CLI packager in Step 2. Enter the values required to generate the token as above and click the 'REQUEST TOKEN' button. A token string will be created at the bottom of the page. Copy the string and paste it into 'CUSTOM_HEADER_VALUE' for each DRM in the Bitmovin player sample file you modified in step 3-2. The final html source will be as below. The token string in the sample code above should be replaced with the value you created yourself through the tutorial. To test playback on both Chrome / Firefox (Widevine DRM) and IE11 / Edge (PlayReady DRM), you need to create and set two different tokens with the 'DRM Type' input as 'widevine' and 'playready'. 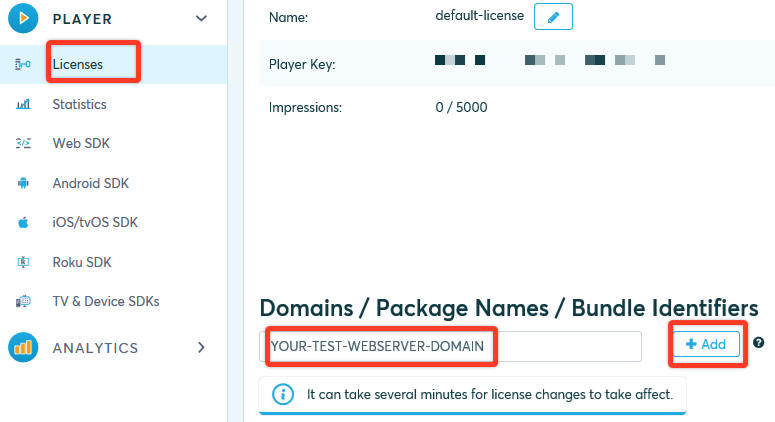 Upload the player sample html file that you set up to the license token string to the test web server. Browse to the sample html page's URL using a multi-DRM supported web browser such as Chrome, Firefox, IE11, and Edge. The Bitmovin Video Player sample page will be displayed as below. If the license token is set up normally, the license will be issued from the PallyCon cloud server click the play button of the player. To apply the token-based licensing to the actual content service, the token must be generated in real time after the user authentication and content authorization process on the server (backend) of the content service site. Please refer to the 'Token integration sample' on the 'Packager and Sample Downloads' page and the token integration guide linked below. Expiration of token: Please increase the token validity period which can be set in the PallyCon console, or create a new token based on the current GMT time. The timestamp value of the token must be entered in GMT time, not in your local time zone. CORS Error: Cross-Origin Resource Sharing (CORS) error occurs when player html file and DASH content file are located in different domains. To resolve the error, you must move the file to the same domain or set Access-Control-Allow-Origin in the response header of the corresponding web server. This concludes the PallyCon Multi DRM and Bitmovin Video Player integration tutorial. If you are having difficulty with the tutorial content, please contact us using the helpdesk account created when you signed up for PallyCon trial. For more information on PallyCon Multi DRM and various partner solutions, please refer to PallyCon Developer's Guide site. INKA ENTWORKS is providing industry leading DRM solutions and service, enabling best-quality content protection for content service providers. PallyCon is a brand name of content protection solutions and service based on INKA's DRM technology.